After a recent medical appointment in Adelaide my wife and I spent a few hours at the Adelaide Zoo. 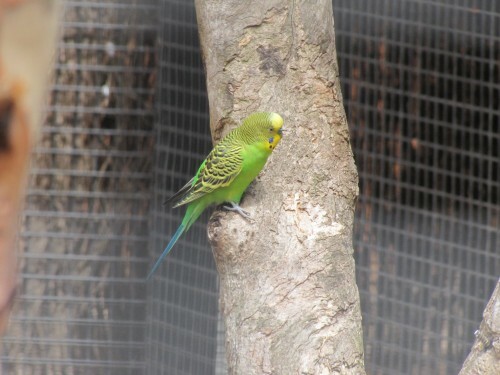 Apart from being the only zoo in Australia to have Giant Pandas exhibited, our local zoo has an excellent collection of birds, especially Australian species. Some of these are in walk-through aviaries, making photography easy. Some, however, are seen through wire mesh. I am quite pleased with the photo above because I managed to focus on the bird without too much blur from the netting. Budgerigars are one of Australia’s favourite birds being kept as a pet by many people. It is also a popular cage bird worldwide. This blog about my sighting of Australian birds has been going for just over five years now. During that time I have published nearly 1200 articles about our beautiful birds. Many of these articles have one and often several photos of birds I have been blessed to get focussed in my camera lens. Over the years a community of people who appreciate birds has grown on this site, and we are approaching 4000 comments and questions, a significant milestone which will happen any day now. (I’ll keep an eye on the statistics and let everyone know. Sorry – no prize for making the 4000th comment.) I’d like to thank all of you who come here regularly, and especially those of you who leave comments. You are appreciated. You may have noticed a logo on the sidebar from the Fat Birder “Birding Top 1000” ranking. This site ranks the top birding sites from around the world. Over the last year my site has consistently been in the top 50 sites, sometimes as high as about #24. This amazes me. The ranking is based on traffic to my site, so plenty of people must be visiting on a regular basis. I use two other programmes which analyse the traffic coming to my site. On one of these I had just over 250,000 visitors last year, but this site can be rather misleading. Google Analytics is a far more reliable indicator I believe, and last year Trevor’s Birding had almost 100,000 visitors – actually, it was just 600 short of that figure. Never mind, figures so far in 2011 indicate that visitor numbers continue to grow. I am planning to continue posting new articles here at least every two or three days – more if I have the time – for the foreseeable future, so stay tuned. And don’t forget to leave a comment or two. I appreciate your efforts. The Emu is arguably the most easily recognised birds in Australia, and I would guess that many non-Australians would also be able to identify one. It is our largest native bird and is flightless. It is found in most parts of mainland Australia but not in Tasmania. These days however its occurrence in built up areas is very limited, but it can still be common in grasslands, farming areas and national parks. Last year on a visit to our local Monarto Zoo (just ten minutes’ drive away) I managed to photograph several cooperative Emus on the various walks we undertook. This was to fill a gap in my digital photo collection; for some reason I hadn’t taken any until then. January 26th is celebrated as Australia Day. This day commemorates the landing of the first European settlers in Australia. This event occurred at Sydney Cove on this day in 1788. Australians celebrate this special day in many ways. Many people new to our country become naturalized Australians in moving ceremonies in many places. Other people attend family gatherings or get together with their friends. Some people go to the beach, others have a picnic or barbecue, and many people attend major sporting events. I’m having a quiet day at home. I’ll do a little reading, watch the cricket and tennis on television and go for a swim in my swimming pool. Normally I’d go out and do some birding, but it’s reather hot today. Instead I’ll share some bird photos with you. The much loved Budgerigar is one of Australia’s favourite birds. Many millions are kept as pets in Australia and in many other countries of the world. One of the most amazing wildlife scenes in Australia is to see a large flock of hundreds and even thousands of Budgerigars. I’ve only even witnessed this on one occasion; it’s marked in my memory as one of the special birding moments. Over the last week or so there have been numerous reports of these beautiful birds moving into the southern parts of Australia, including close to my home here in Murray Bridge. I’ll have to keep a special lookout for any that come our way. If you have one of these beautiful Australian parrots as a pet, tell me about it in the comments section.